A self-assessment form example helps decide whether a candidate is suitable for community engagement training or not. The form has a list of open-ended questions directed solely to an individual. The assessment is necessary because it helps to find the right people to engage in community service. Besides acting as a communication channel that enables you tell others about yourself, a pre-training self-assessment form can help you know yourself better. 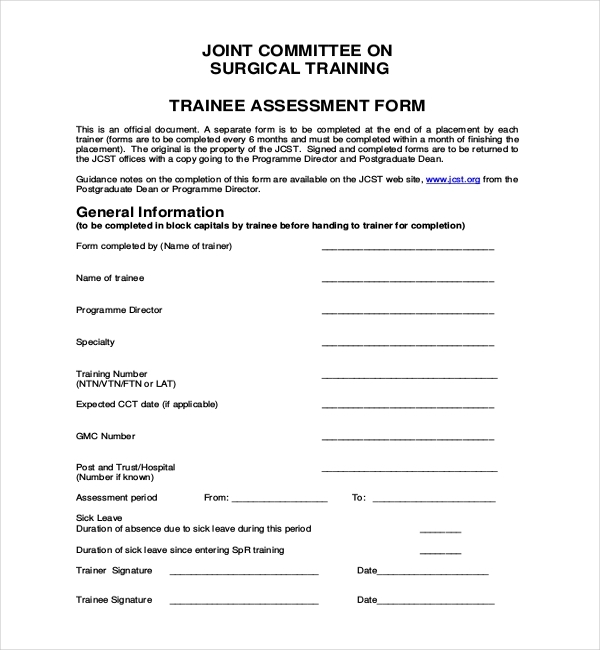 A Surgical Training Trainee Assessment Form has two primary sections: trainee and trainer section. A trainee fills their part and then hands the form over to the trainer. The trainer will judge the performance of a trainee based on criteria, activities, attitude and knowledge. The results will help the trainer decide if the results are satisfactory or not. If the results are not satisfying, a trainer will be required to retake the training. 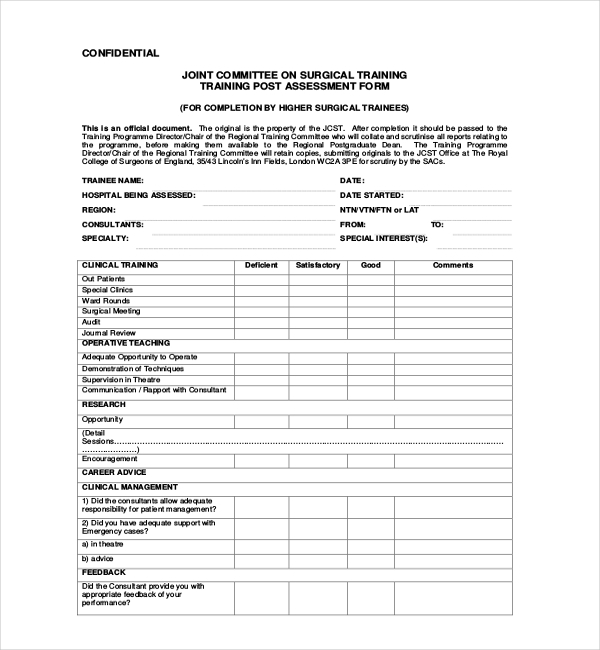 A post training assessment form is a significant tool used to evaluate the performance of a medical intern. Although how medical interns conduct themselves in a medical environment may play part in content grading, it is often not significant to judge the trainee based on their behavior as a person. 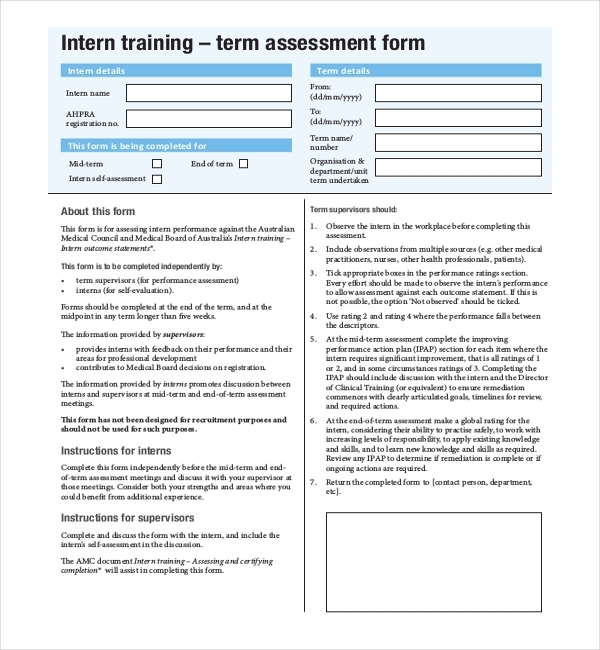 Therefore, the content of intern assessment form must stick to the original goal of the evaluation. A Practical Training Assessment Form is a cost-saving tool. 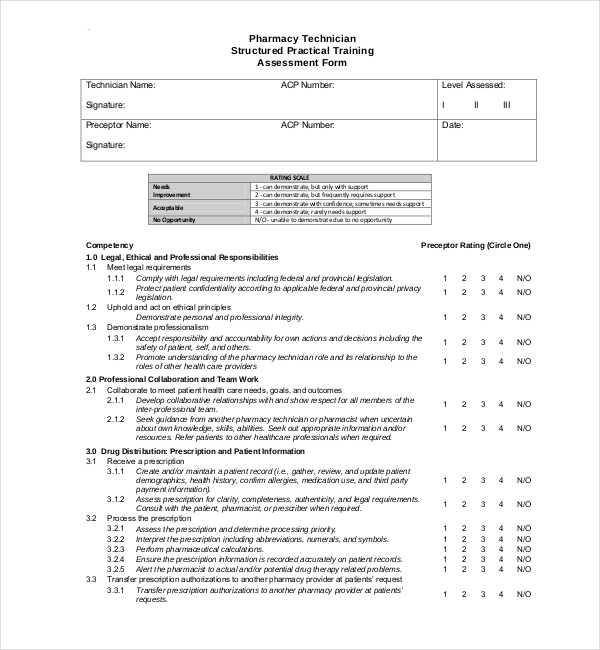 The form has content with rating options beside each question or statement. The purpose of the rating scale is to determine the strength or weakness of the content under study. Understanding the strength or weakness of content recorded in a training assessment template will help improve presentation, feedback and training methods. 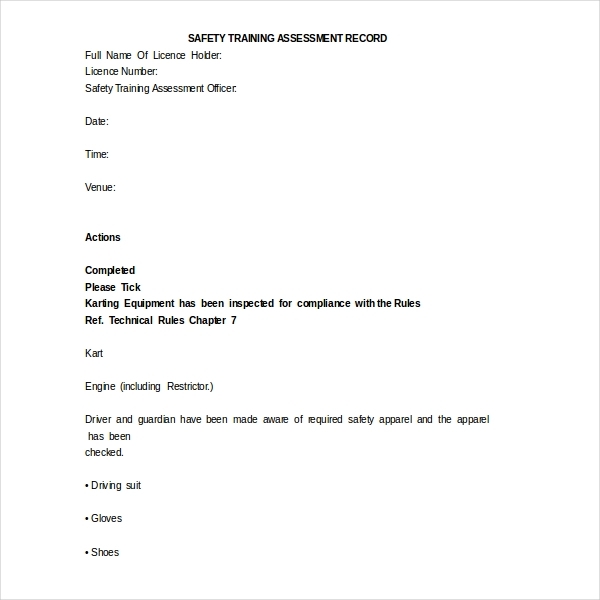 Because it is necessary to conduct a safety assessment training to comply with the law, you will find a Safety Training Assessment Form very useful. The law requires that businesses protect people, so you must identify and manage hazards the soonest time possible. The only way to do this is to use a safety assessment template to identify risks and suggest practical risk management techniques. Training needs assessment questionnaires will help you gather the data required to determine what training needs. In training, needs are like data without which effective training would be impossible. In fact, the only way to accomplish your company’s goals in terms of the training is to have the correct data. If done correctly, the training will help you to identify area of needs and gaps in performance, skills and abilities. 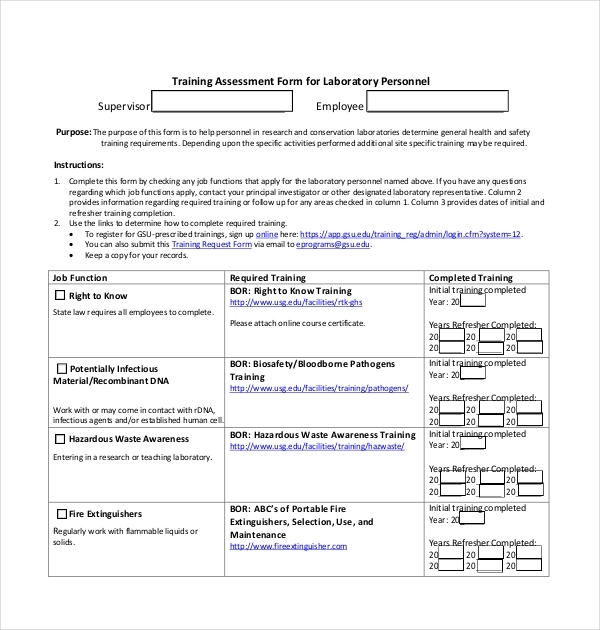 Lab pros must use Training Assessment Form for Laboratory Personnel to decide whether a laboratory is safe for use or not. The assessment must be in agreement with laboratory safety standards for accuracy and authenticity. It is necessary to record the results of the assessment, because the data will help to determine whether the laboratory in question meets the safety and health training requirements. 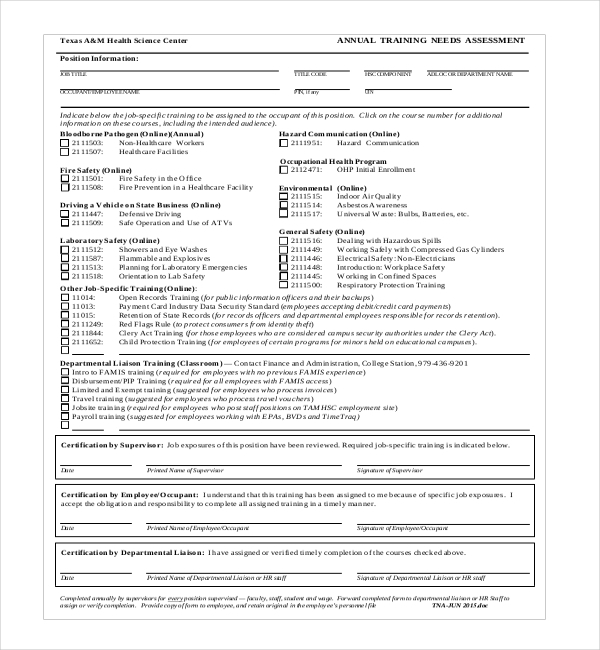 You can only use a Training Post Assessment Form to test employees after training. 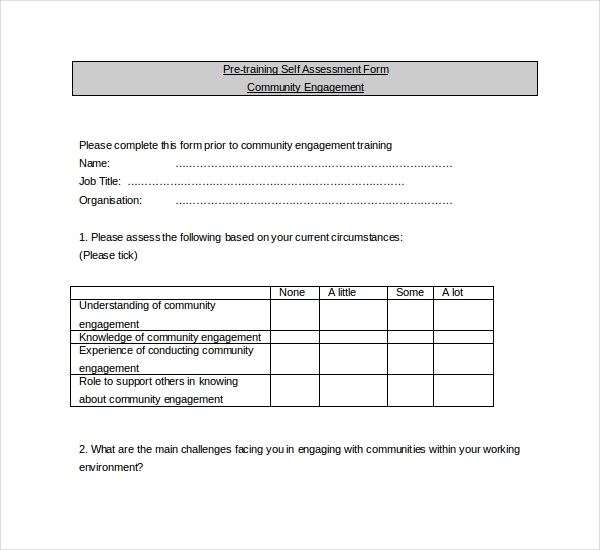 To assess anyone prior to community engagement, you might want to consider using a Pre-training Self-Assessment Form. Usually the purpose of training evaluation is to not only discover whether an employee achieved the training goals, but also gain insight on the effectiveness of the training. What Should Go in The Assessment Form? The form must have professional questions, and each question must be open-ended. Let trainees give their personal reviews about the training. A couple of closed questions are okay, but they should appear randomly on the form. Ask questions that align with the goals of training. The assessment should be about finding out whether the training met the targeted goals. Although you can write the training test on your own, feel free to ask other professionals for help. Asking for professional help is necessary because it helps you create real-world questions, which guarantee real-world expectations. Moreover, your questions must be precise and easy to understand.